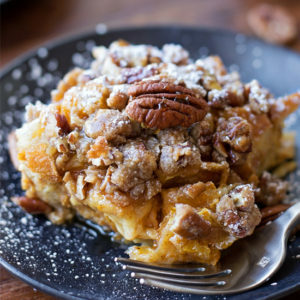 This overnight pumpkin french toast bake is the perfect dish for chilly fall mornings. 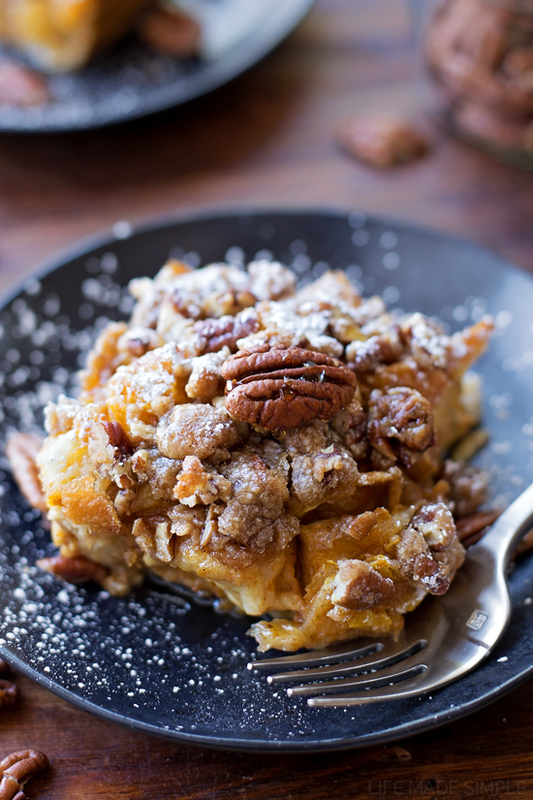 It’s topped with a chunky spiced pecan streusel. Soups, one-pot meals, and overnight bakes are everything right now. Our family seems to have caught a virus that won’t go away. This is round 2 and I’m exhausted. It’s one thing when you’re sick, another when your kids are sick, but a completely different ball game when you’re ALL sick… for 2 weeks (again). We’ve been surviving on easy meals, breakfast for dinner has become a frequent request. 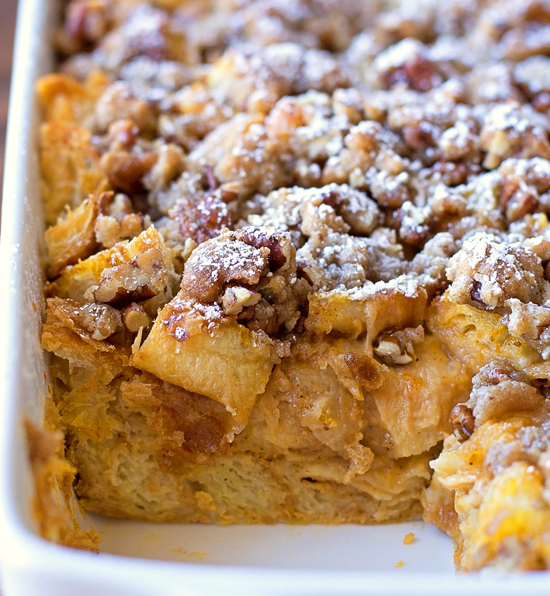 I’m talking eggs, bacon, smoothies and this french toast bake. It’s super easy to prep. Mix everything together, toss it in the fridge to rest overnight, pull it out, add the streusel right before baking and then pop it in the oven to get all crunchy and caramelized! 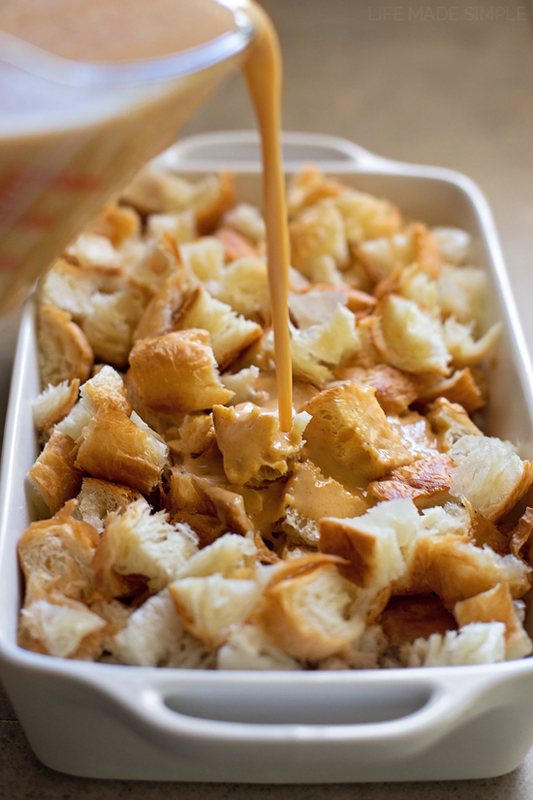 You can use almost any kind of bread (challah, brioche, croissants, french bread etc), just cube it up and toss it into a buttered baking dish. Pour the spiced pumpkin mixture over top, then wrap and refrigerate for a minimum of 4 hours. Before baking it, you’ll want to make the streusel topping. In a medium mixing bowl, whisk together the brown sugar, flour, pumpkin pie spice, cinnamon and salt. Using a pastry cutter (or your fingers), cut in the cold butter until small chunks form. Mix in the chopped pecans (totally optional) and combine. Sprinkle the streusel over the refrigerated bake. Place in the oven and bake for 45 minutes to an hour (you may need to tent the top of the bake with a piece of foil during the last 15 minutes to prevent over-browning). Remove it form the oven and let it cool/set for 5 minutes before serving. Dust the top with powdered sugar and drizzle on some maple syrup… then dig in! 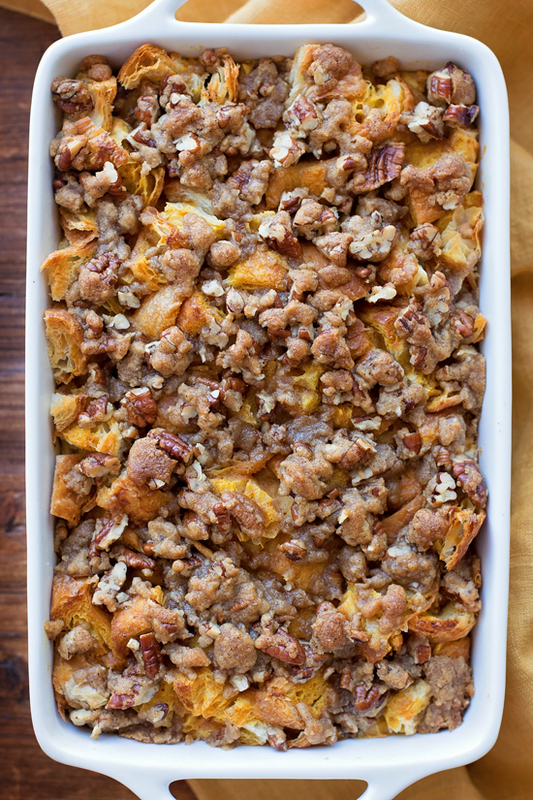 This overnight pumpkin french toast bake would be perfect for special occasions (Thanksgiving or Christmas morning) or for those lazy weekends (or weeknights)! 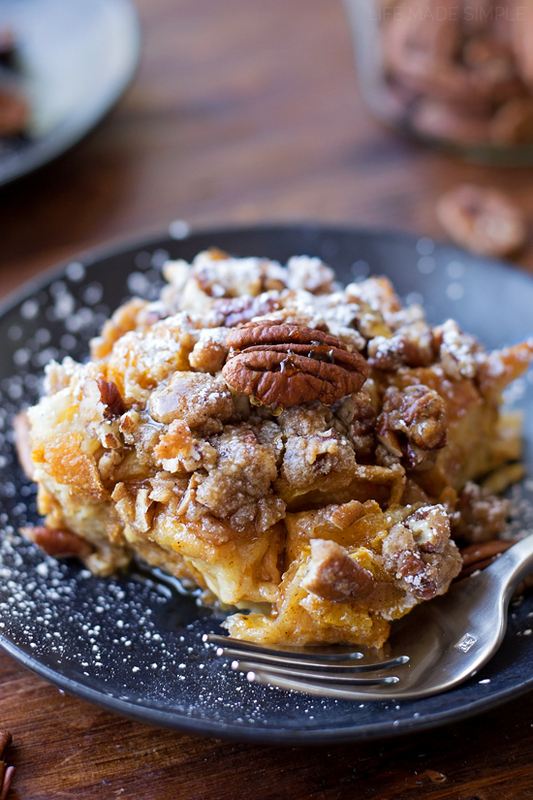 This overnight pumpkin french toast bake is the perfect dish for chilly fall mornings. It's topped with a chunky spiced pecan streusel. Butter or spray a 9x13-inch baking dish, add cubed bread; set aside. 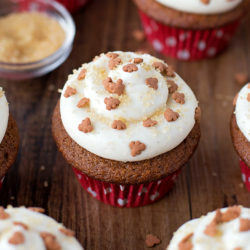 In a medium bowl, whisk together the milk, cream, sugars, eggs, pumpkin, vanilla, pumpkin pie spice, and cinnamon. Pour the mixture over the bread. Cover with plastic wrap and refrigerate for at least 4 hours, preferably overnight. To make the streusel, in a medium mixing bowl, whisk together the brown sugar, flour, pumpkin pie spice, cinnamon and salt. Using a pastry cutter (or your fingers), cut in the cold butter until small chunks form. Add the chopped pecans and combine. Sprinkle the streusel over the refrigerated bake. Place in oven and bake for 45 minutes to an hour (you may need to tent the top of the bake with a piece of foil during the last 15 minutes to prevent over-browning). Remove form the oven and allow to cool/set for 5 minutes before serving. Serve with a dusting of powdered sugar and maple syrup; if desired. -Day old bread works best. -If you don't have time to let this set overnight, allow it to rest in the refrigerator for at least 4 hours. Thank you Nakysha! I’m always cutting sugar down too, I like things sweet, but not overly sweet (especially for breakfast)! Can you add the streusel a little before the end of cooking time instead of cooking at the beginning and have to worry about over-browning.? If yes, at what point can you add the streusel. 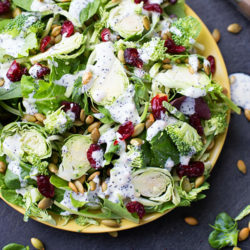 Recipe looks great. 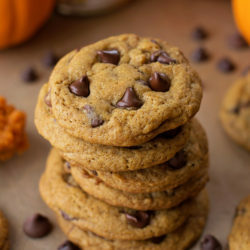 Can you make this without the pumpkin? Yes, but you would need to add more liquid or it will come out too dry. I have some leftover pumpkin pie filling I had already made up at Christmas to make two pies in the freezer. Would that work to pour over the bread? It will have different amounts with egg, milk, flour, etc. from my pumpkin pie recipe.